A Golem, fired up with mystical energy. Sculpting and quick texturing using UV Perspective. Also uses "Mask by Curvature" and "Mask -> Colour" to shade the corners and edges of the model a bit brighter. Lighting and effects all completed inside Curvy. 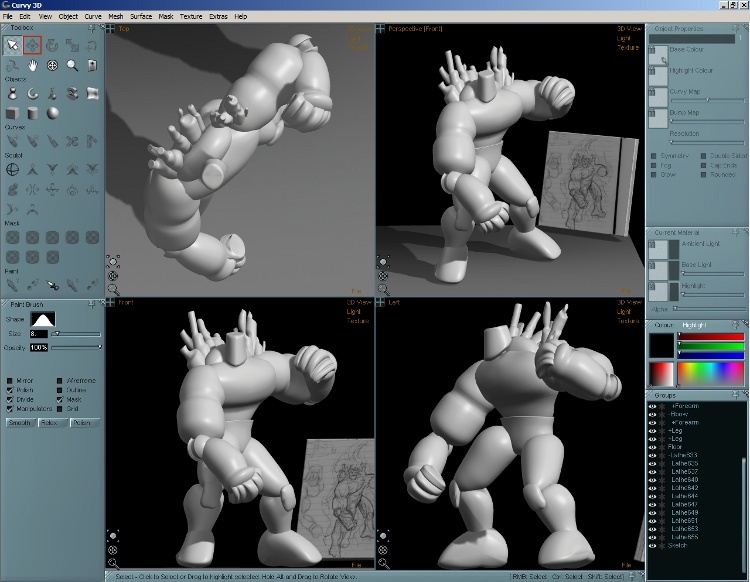 The energy effect uses the "Glow" and "Fog" Object Properties to allow the light effect to be painted on 3D surfaces in the scene. Last edited by Simon on Mon Aug 12, 2013 9:01 pm, edited 3 times in total. Added some sculpting and texturing. C is missing : Scream's pain of Clicking dost my Keyboard a Thinkin'. I need a new Laptop. This is just an awesome creation. I have to say that seeing this, and what could be done with this product (especially for non-artists like myself - lol) was the defining factor for me purchasing Curvy 3D. I know I'm not going to be able to make anything on this scale right away, but I hope to get there eventually. Maybe with some pointers from this community, I can achieve such a thing. When you break the art down into steps it gets simpler. For this pic I did lots of googling for golems, and for the kind of pose I wanted. Then it was almost like making a collage out of all the ideas and shapes I liked to make a rough sketch. The basic sketch-sculpting is more of a technical task than requiring too much artistry as it is mainly based on tracing the shapes from a rough sketch. Then the last stage of detailed sculpting, texturing, lighting is all about experimentation for me - I like just trying lots of things out and seeing what works. Truly amazing art! Looks so fantastic. I like your golem a lot. You managed to make it feel unique, despite golems being done a million times already.